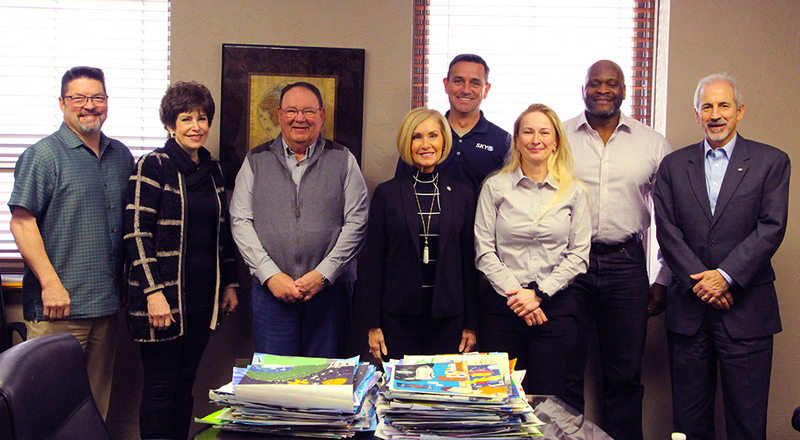 The Oklahoma Aeronautics Commission (OAC) hosted “celebrities” from the Oklahoma aviation and aerospace community judge the 2019 Aeronautics Commission Aviation & Aerospace Art Contest. Pictured left to right are, Brian Dahlvang, communications program specialist, FAA Monroney Center, Aeronautics District 4 Commissioner Lindy Ritz, former FAA Monroney Center director and current president of the Ritz Group who also serves as the assistant director of the FAA Center of Excellence, Brigadier General Ben T. Robinson, former Commander, 552nd Air Control Wing at Tinker Air Force Base and owner of Century One, LLC; State Representative Tammy West from House District 84, Assistant Majority Whip and Majority Caucus Chair; Retired Army Chief Warrant Officer 5 and Journalist, Chase Rutledge, pilot for KOCO’s Sky5 helicopter; Britton Lee, single and multi-engine certified flight instructor and designated pilot examiner and airframe and powerplant mechanic; Jeff James, vice president of aerospace education for the Air Force Association Gerrity Chapter #215; and director Victor Bird with the Oklahoma Aeronautics Commission. The top three entries in each age division are forwarded to Washington, D.C., where they compete nationally against other winners from the U.S. for the right to advance to the international competition.